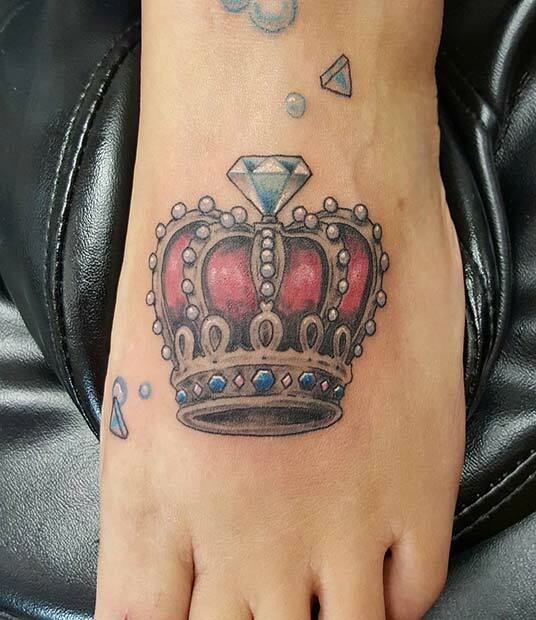 Here is another example of a crown and diamond design. 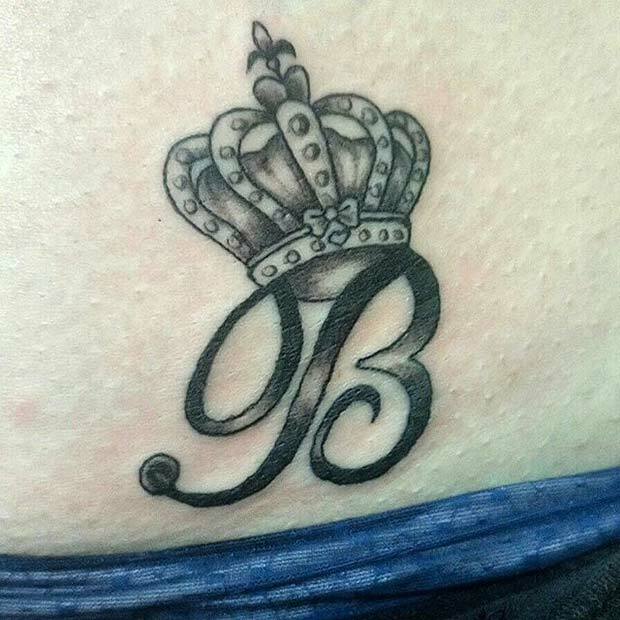 A tattoo like this is perfect for the girl who loves luxury. To re-create this, you could keep the design with the traditional colors or you could add in some of your favourite shades. The ink would look stunning on other places on the body to. 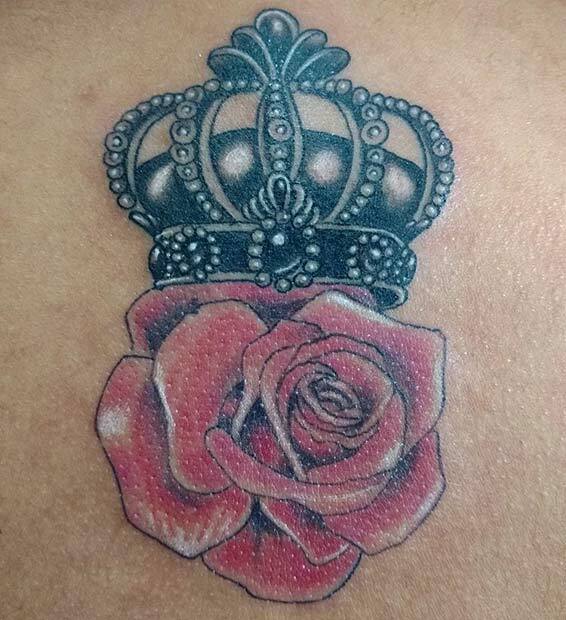 Our next crown tattoo is very delicate and feminine. It features a small crown with dainty flowers around the edges. A design like this is great for someone who wants a soft and light tattoo instead of a bolder one. You could re-create this with any flowers of your choice. Want an eye-catching tattoo then think about a hand design like this. 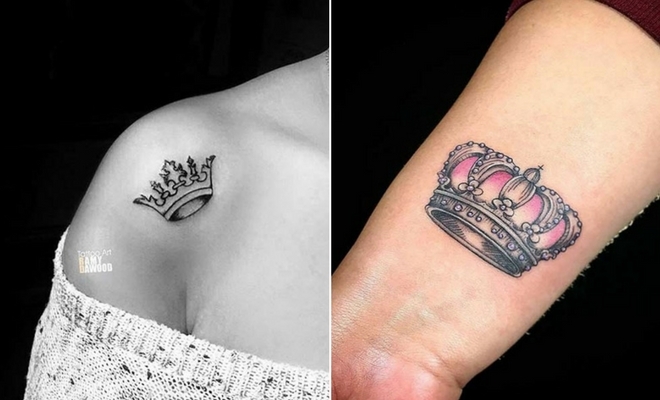 The simple crown has been colored in black ink which makes it bold. This is a beautiful crown that would also look great on the wrist, on the ankle or behind the ear to. You could even just have the outline for a subtler tattoo. Roses and crowns are very popular. Here is another example of how to style these two together. This design features a vibrant red rose with a black ink crown. It is a very stylish piece that could be added to in the future. Would make a great arm tattoo. 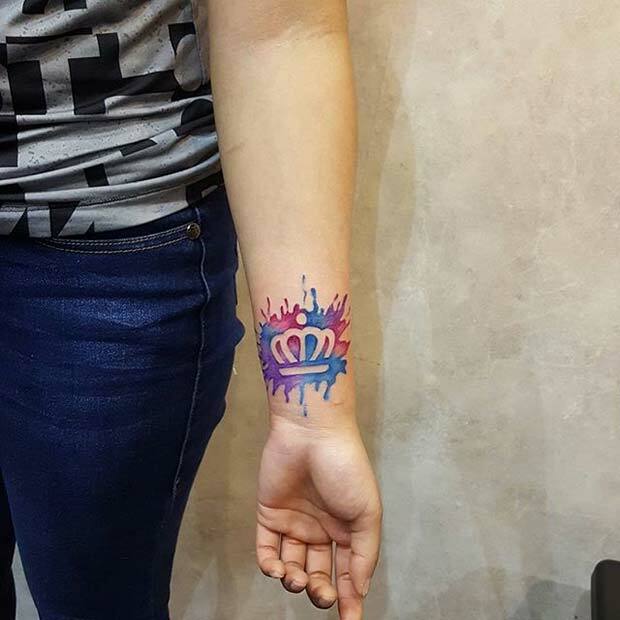 You could even add some color to the crown. Tattoos are more than just a trendy accessory; these designs can also be very meaningful. 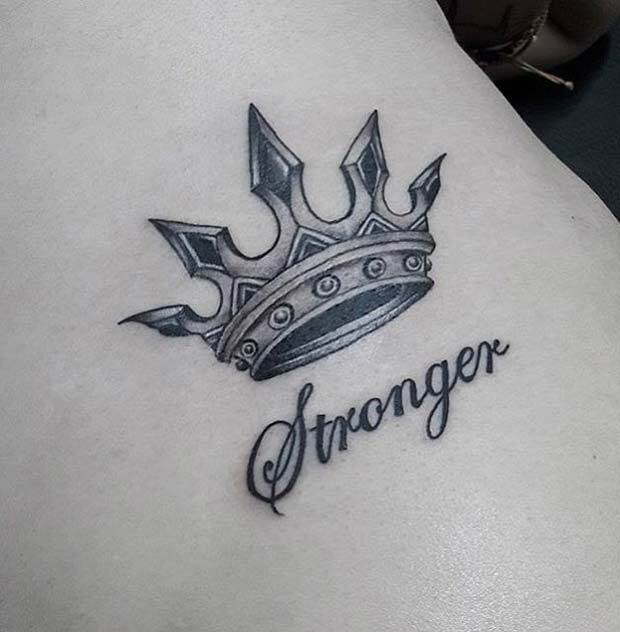 This ink features a bold crown with the words stronger underneath. For someone looking for a strength tattoo something like this would be perfect. You could also replace this phrase for something personal to you. Here is a design for the women who love minimal style. 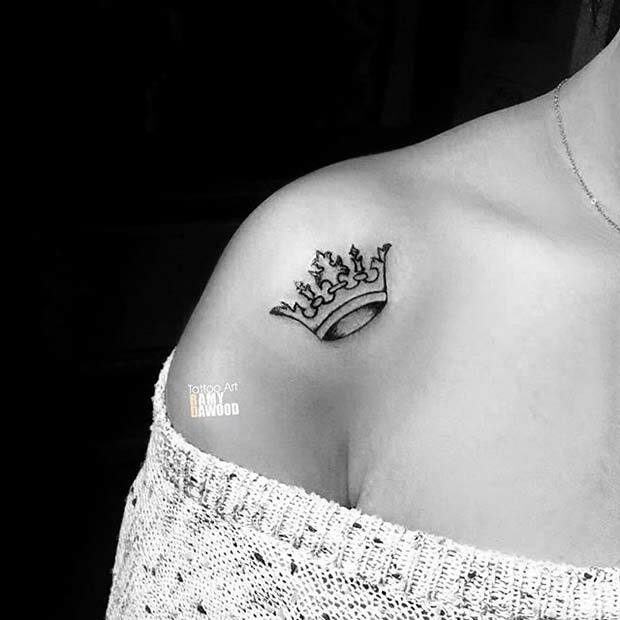 This simple, black ink crown creates a trendy piece. A tattoo like this will suit everyone. You could have it bigger or smaller and place it almost anywhere on the body. It is cool tattoo that will never go out of fashion. Our next pick is bold and vibrant. This watercolor piece features gorgeous blues, purples and pinks. It is a fun tattoo that could be re-created with your favourite shades. You can have bright colors or softer ones, the choice is yours. 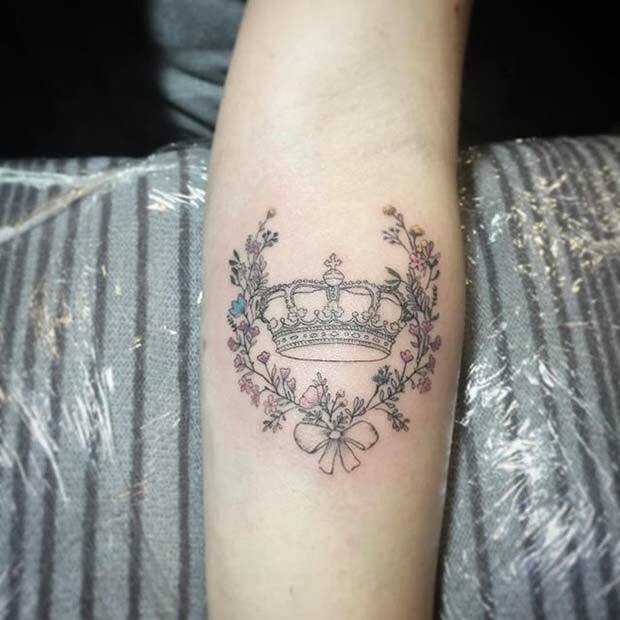 The crown design is super cute to. Shoulder tattoos look very trendy as you can see with our next pick. The simple black ink creates a chic look that will suit any woman. You don’t just have to have a design like this on the shoulder you could move this somewhere else like the wrist, ankle or foot to. It is a simple but gorgeous design. Have someone special in your life? Maybe it is a best friend, partner or family member. If so consider a crowned initial like this. It is stylish and subtly shows someone they are important to you. 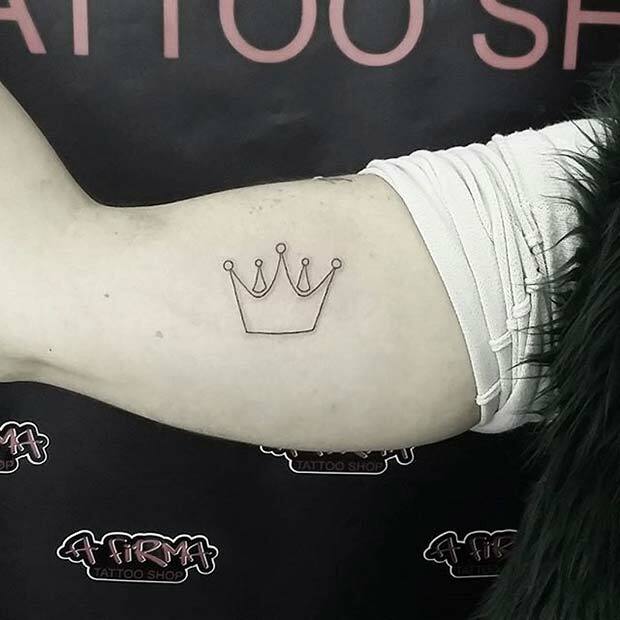 Any crown design would look cool, you could also choose any font for your letter. 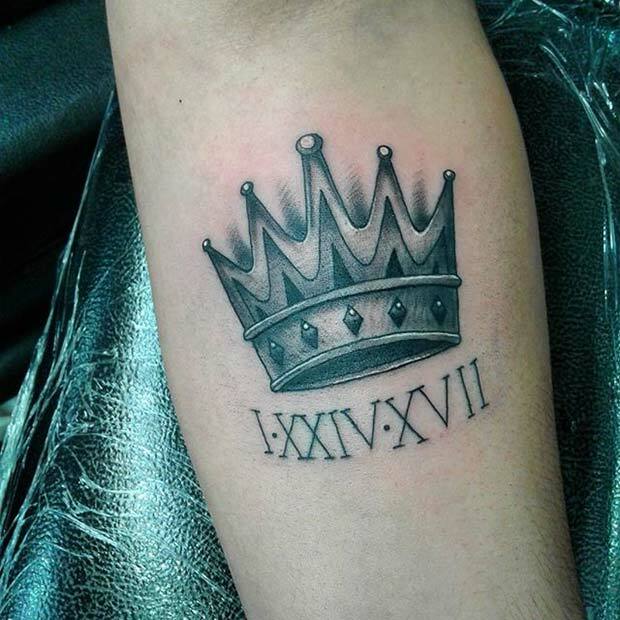 Next, we have a unique crown and roman numeral piece. The crown used is bold and stylish, you could pretty it up a bit with flowers or color. Roman numerals are a clever and creative way to remember a special day. You could have a special date like a marriage or birthday. 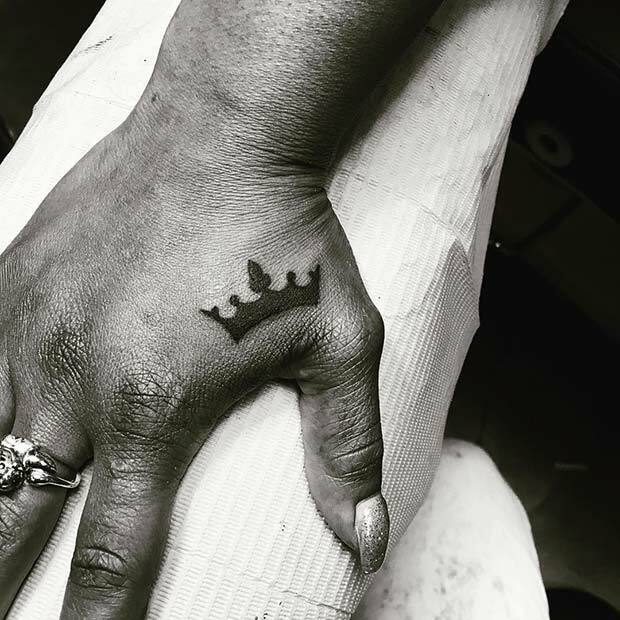 If you want a personalized crown tattoo this is a great source of inspiration.